Surf and turf? If your home soil is rich and volcanic and the ocean beckons you from all directions, slake your thirst with the Hawaii Drink Ticket. 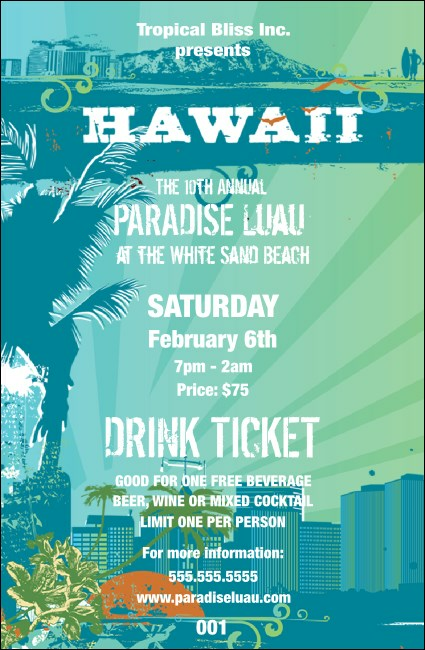 Any time you're serving drinks in the Aloha State, you can make everyone's life a little bit easier when you choose securely numbered Drink Tickets with matching Event Kits. Fill out the easy template below to start! Ride that wave all the way in with Event Kits from TicketPrinting.com.